Social Finance or SoFi, a network that wants to transform the US student loan industry, has raised over $77 million. The student debt problem recently broke the $1 trillion barrier eclipsing both the national credit card and car loan debt. Many companies are also trying to address this problem but none of them are as aggressive in the social front as Social Finance. The initial round of funding was led by Baseline Ventures, with contributions from DCM and Renren, China’s largest social networking site. Renren has invested $49 million to Social Finance in September of 2011. SoFi is led by Stanford alumni Nino Fanlo, former executive vice president of Wells Fargo and Ian Brady, the former director of innovation for Fidelity Investments. 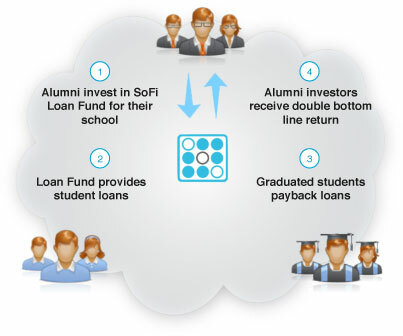 SoFi is developing a lending solution with lower loan rates than the federal standard that also gives similar borrower’s protection by creating connections with alumni investors. This approach that switches lending institutions from banks and the government to previous alumnus of schools has so far increased commitment from alumni lenders and loan applicants. It is called the “Double Bottom Line Investing” where alumni invest in a pool of loans for students of their school. The alumni provide immediate value at a lower fixed loan rate while getting a return on their investment. Alumni also have options to invest through a 401k account or an IRA account. It’s called the double bottom line since the alumni both get social and financial benefits. So, how appealing do you find the notion of ‘Double Bottom Line Investing’? Do you believe that a trusted network, social media interactions and crowdfunding are the answers (or at least part of the answers) for solving the U.S. student loan debt problem?